Curling arabesques, golden arch, and royal crimson inlaid in amethyst purple complement the dappled orange-bronze foliage of the tree under which a pair of peacocks nestle. In Eastern traditions, the peacock is the guardian of royalty and also an emblem of nurturing, magnanimous, and immortal love. The Birds of Paradise (II) is perfect for the romantic couple with refined tastes and a firm conviction that grace and integrity are fundamental to a good relationship. 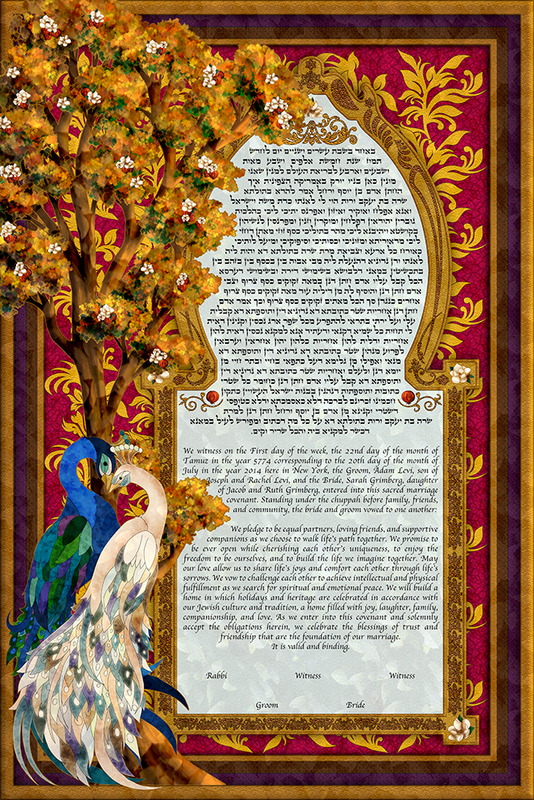 Blending Art Nouveau styles with Persian motifs, this ketubah demonstrates you don’t need to be gaudy to show your true colors.